First fold a piece of 6" x 9" white card stock for the base, a 4 1/4" x 5 3/4" piece of yellow card stock for the first layer, a piece of 4" x 5 1/2" of Stampin' Up! Moonlight Designer Series Paper for the background, a piece of 2 1/2" x 4" piece of white card stock for the Koala's first layer, a piece of 2 1/4" x 3 1/4" piece of yellow card stock for the middle layer and a piece of 2" x 3 1/2" piece of white card stock for the koala. 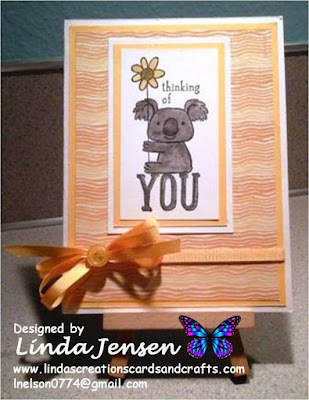 Next using a Stamp a ma jig stamp the koala in Stazon Jet Black ink then color the koala with an aqua painter and Stampin' Up! Basic Gray ink then the Flower with Stampin' Up! Hello Honey ink. Then attach the koala to the yellow middle layer, then to the white layer, then to the background. Next attach the background to the yellow layer, the Stampin' Up! Hello Honey ribbon on the back of both sides of the yellow card stock, make the ribbon with a mini bowdabra and attach it with hot glue then attach the button. Next attach the yellow card stock to the white base and enjoy!